What I love about CrossCode, an action-RPG that came out on Steam earlier this year, isn’t just that it’s charming as heck and feels great to play. No, what I love about CrossCode is that it’s secretly a puzzle game. Don’t miss out on this one, folks. 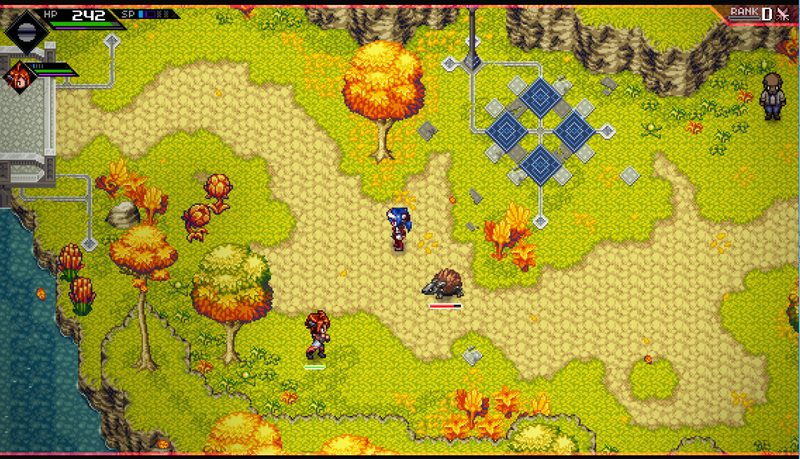 CrossCode, which I started playing last week after seeing it on Fahey’s GOTY list, is like a cross between .hack and Zelda. Set within the world of a fictional MMORPG called CrossWorlds, CrossCode has you play as an avatar named Lea who’s trying to figure out who she really is, while also uncovering mysteries and hearing plenty of MMO jokes along the way. She’ll slash up monsters with sword swings and a ranged bullet attack in Zelda-style combat. It’s a role-playing game on the outside, complete with shops and weapons and endless side quests, but at its heart it’s a puzzle game, one that isn’t afraid to kill you over and over again. Your job is to jump from platform to platform, sequentially activating switches and avoiding bullets from the nearby turrets. Get hit by a bullet and you’ll go plummeting into the abyss and have to start over again. You’ll have to dodge and block these projectiles as you jump, which can get pretty hairy, but when you die, you’ll just pop right back up on that leftmost ledge. Moving around feels great thanks to CrossCode’s sleek physics, and when you finally do finish the sequence after a few dozen deaths (don’t judge me), you’ll get the delicious jolt of satisfaction that comes with finishing a good puzzle. Those are the obvious puzzles. What makes CrossCode really special is that every new room you explore is its own little puzzle box. Run into a new enemy, for example, and you might realize that he’s only susceptible to your long-ranged attacks. Spot a couple of boxes in the corner of a town’s alleyway and you might figure out that there’s a secret passage if you jump up high enough. CrossCode is massive—it’s an MMORPG, after all—and every new map screen is full of satisfying little moments. Although it’s a 2D game, there’s a lot of verticality in CrossCode, and each region is full of ledges, cliffs, and tricky jumps. It’s got a really great rhythm. As you move from map to map, you may find yourself slowing down and learning the layout of each level so you can figure out how to get high enough to reach every hidden chest and secret. The designers have thrown in a lot of smart vertical tricks and illusions, ones that I’ve very much enjoyed trying to figure out. I’ve only played a few hours, so it’s too soon to say if CrossCode would have made my 2018 top 10 list had I played it earlier in the year, but so far I’m in love with this game. The developers of CrossCode say it’s not coming to Switch, which is too bad, because this is a game that feels designed for Nintendo’s newest platform. But if you’re into Zelda-likes, you should play it nonetheless.